It’s your first week at your first startup job. Amazing, congrats! You know how to do literally everything already, right? Wait, I’m sorry…you don’t? Well, we’ve got good news and better news: 1) you don’t need to know how to perform every task right away—no one expects that of an entry-level hire. And 2) a little thing called Google exists (maybe you’ve heard of it). Why, though, are we talking about a search engine instead of the human search engine known as your manager? Glad you asked. You should not rely on your manager to answer every question. The simple reason? You were hired to take work off of your manager’s plate, not pile more on. Even if your boss does have the answer to every question you can come up with—which is very, very unlikely—responding to your every query is almost certainly not the best use of their time. Plus: self-sufficiency is a good look. Put yourself in your manager’s shoes. Would you rather have an employee who figured things out pretty much on her own, or one who pummeled you with questions throughout the day? But how do you decide what to ask, and what to try to figure out on your own? It can be a little tricky at first, but we’ve got you covered. You just need to learn a simple skill. Need to design a simple infographic, but don’t know where to start? Try searching “simple free infographic tool” and be blown away by the bounty of useful platforms and templates on the internet. The same goes for all kinds of skills—if you need to do something quickly, and it doesn’t need to be perfect, teaching yourself is a great option. One caveat: if you know your boss is incredibly particular about the way this task is performed, it might be worth checking in before Googling. The process doesn’t exist yet. Let’s say you’re tasked with unknotting a big, logistical problem your startup faces, and to find a way to prevent that same knot from forming again. Sounds fun! Also sounds like you’re on your own, to some degree. 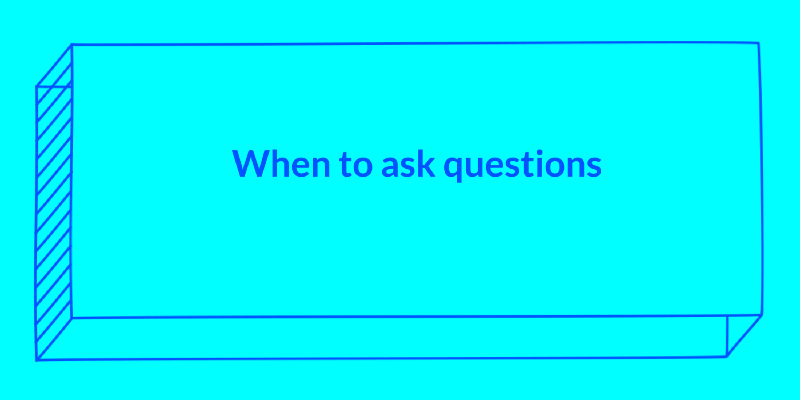 You’ll probably want to ask questions at some point down the line, but do what you can to problem solve on your own first. You were tasked with this job for two reason: other people on the team don’t have the bandwidth and your manager believes you can do it. Have some faith in yourself. Your boss asked you to figure it out. This one should be a no-brainer, but it bears repeating. Did your boss ask you to edit a video, because someone needs to do it, he doesn’t know how, and he’s swamped? This is not the time to ask him how to. You’ve been given this information before. In this case, you shouldn’t be searching the internet—you should be searching your email account and your own notes. (You’ve been taking notes, right? Good.) If you really, really can’t find the info you need, after an exhaustive search, then you can ask—but do what you can to avoid it, and try to make sure you keep track of information next time. When you need access to a company-specific piece of information, a platform, or a password. If you can’t continue working without a piece of information that cannot be found on Google, it’s a pretty good time to ask a question. First, to be safe, take one more pass through your onboarding materials, and see if there might be anything you missed. Was your work email login info sent to your personal account? Is there a password manager where instructions or password are stored? When you’re making a decision with real consequences. Debating between several intern candidates? Considering hiring (or firing) a contractor? About to make some big, sweeping changes to the architecture of your company’s website? These are all moments when there’s not necessarily a clear-cut answer—and your manager’s experience would probably help you in a serious way. Asking for input also ensures that you have the buy in and permission to proceed. If you’re deciding whether or not to buy something for the office, sign up for a platform, or make any other purchase that you haven’t discussed first, it’s worth flagging for your manager. When you want a gut check on a large, important project. 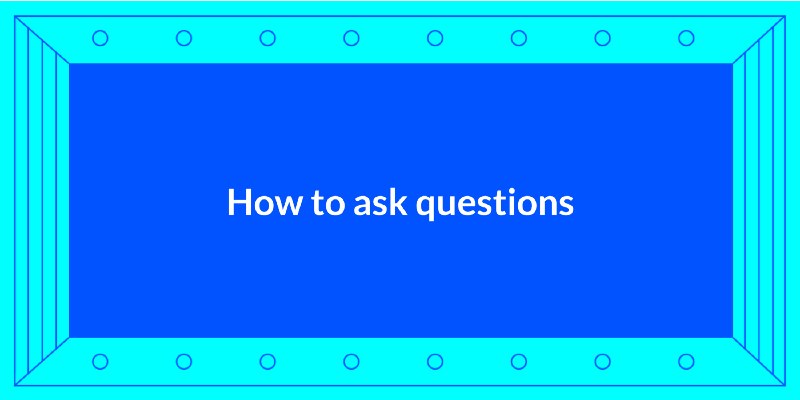 If you were tasked with a serious, meaty project, like overhauling your company’s website or building out your nonprofit’s annual report, we strongly recommend asking questions early and often. There’s nothing worse than spending weeks completing a project in isolation only to discover that you’ve gone down a wildly wrong path—a pretty common pitfall of entry level startup employees, who are often given a lot of responsibility and minimal oversight. Okay, so you need to ask for help? Consider this approach. When possible, ask a peer first. If the question is something that anyone on your staff might know, consider asking a more junior member of the team first. Again, your job is to take work off of your manager’s plate and free up their time. So try to ask the most junior person who likely has the answer. Sure, the CEO probably does know where the extra paper for the printer is stored, but the operations associate does too. Asking a peer will save you a conversation with your manager, and it’s not a bad way to make a friend. Just make sure that when the opportunity presents itself, you find a way to be just as helpful as the colleagues who gave you a hand. Try to save questions for a regularly scheduled checkin. If you have a checkin with your manager every week, see if you can save up your questions until that time—it will be more efficient and less distracting for your manager if she can tackle all of these needs at once. Plus, if you’ve been keeping careful track of the information you need, it will make you look conscientious and detail-oriented. When is it ok to ask on the spot? You need this question answered before you can do any other work. Have you exhausted the tasks you can complete without this piece of information, and exhausted your search? Okay, go ahead and ask. You need this question answered right now in order to meet a deadline. 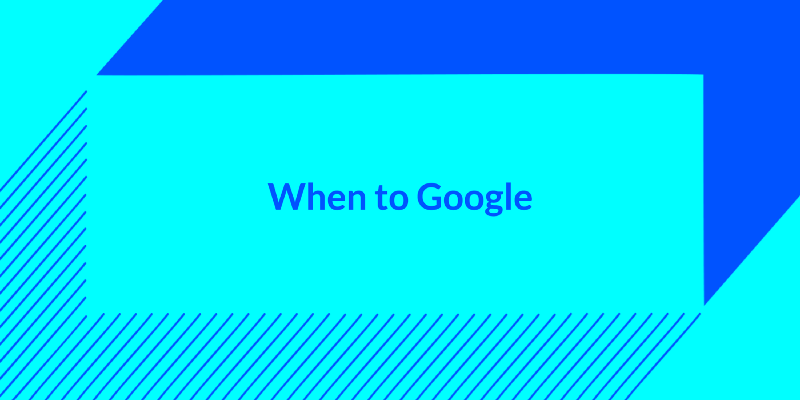 If there’s a deadline looming and you need to learn how to do something fast—like, faster than fast—this might not be the moment to waste time Googling. Acknowledge that you would have rather taken the time to learn by yourself, and ask away. You made a medium-to-large mistake. Did you send out an email blast to 20,000 people only to discover a link was missing? Accidentally cc: a client on a thread that they definitely shouldn’t have seen? This is the right time to fess up and get advice fast. It’s probably not the first time your manager has seen this particular mistake—it’s possible they’ve even made the same one—so it’s wise to get their input as quickly as possible, even if you’re nervous. Something unpredictable happened, and you don’t know what to do. If someone’s making inflammatory claims about your company on social media, a coworker from another department asks you to do a large project that doesn’t seem related to your job, or your CEO drops by your desk and requests that your department change its strategy, these are all great moments to talk to your manager. These tips may seem small, but they’ll go a long way towards making you into the kind of self-reliant worker your boss will feel comfortable trusting with more and more responsibility. There are no stupid questions—but sometimes, you’ve gotta ask yourself first. Read more startup career advice on Office Hours.